Sandstorm's Blog (Home of ssUltimate Library): The Best Excuse Letter Ever!!! Just a few months back I created my facebook account because of requests by my relatives. While I originally do not wish to do so because I am already busy with the forum, my ssClasses library, as well as work in the office; I created one for them. And saw this letter the other day tagged by a friend. When I read this, I cannot help but really laughed hard especially here in Papua New Guinea where all sorts of excuses are used. They are even killing their own relatives, as an excuse "Sorry Boss, Mama Blong Mi Dai". Later, I will hear that the guy's mother is still living strong and when I question the guy for using that ugly excuse, he will still try to squirm out of that by saying "Eh Boss, tru! Mama blong mi dai but mi bringim long marasin man long ples bilong mi na disla marasin man putim long hap hens blong em na mama blong mi openim ays blong em na naw orait!". Translation of pidgin to english "Eh Boss, it is true! My mother died but then I brought her to a (quack) doctor in our village and this doctor has waived his hands over my mom, and my mom suddenly opens her eyes and is now alright!". It is true, someone has used that excuse to me! LOL! Such absurd excuses are really very common here. That later I learn to realize that one person has also several mothers, fathers, uncles, sisters and brothers. Sometimes those person are really not related in any way blood-wise to them. They simply call those persons Ankel blong mi (Uncle belong to me or my uncle). So every time someone comes to me with something like that again, I will smile and ask, "tru-tru papa bilong u? (Is he your real (true or trully-true, LOL) father?)". And when they smiled, I caught them! Then later I was informed that that letter actually comes from an elementary Filipino student way way back before. And while the contents appear to be funny, you cannot help but to admire how this little child, in his full innocence back then, has attempted his best to explain in English his predicament at that time. And because admittedly when you first read this letter, it is amusing, his teacher has hidden it for safekeeping after all these years and maybe has suddenly came across this again so by impulse has posted it in her FB. The kid is now a working man! And while the words during his kiddie times are in some ways confusing, the thoughts are very clear. And what is wonderful and admirable about this letter is his attempt to explain it on his best English that time. Salute to you young man! 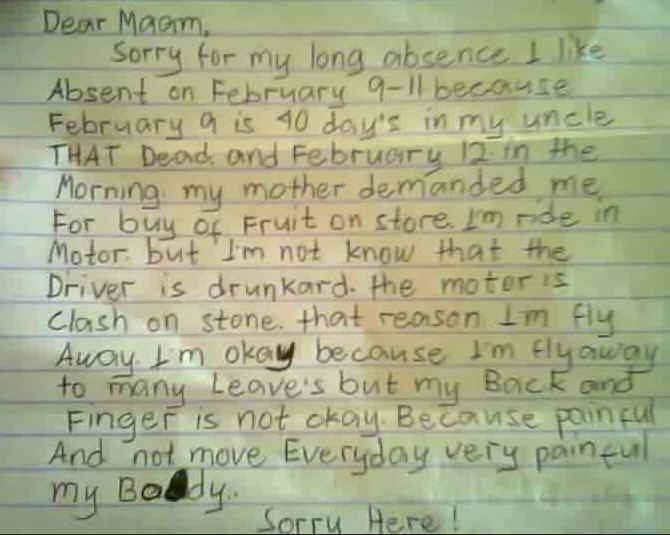 This is really The Best Excuse Letter I have Ever Read!